When researching the history of Russians in London, Alexander Herzen presents a considerable problem. He is without doubt the most significant of all the writers and activists who visited London in the nineteenth century, not only because he settled in the capital for some years (1852-64), but also because many of his compatriots — Turgenev, Chernyshevsky, Tolstoy, Dostoevsky, Nekrasov, Pavel Annenkov, Vasily Botkin, Vasily Sleptsov — came specifically to see him. It’s certainly true to say that neither his closest friend Nikolai Ogarev nor Bakunin would have ended up in London if Herzen hadn’t been here. He is also the author of one of the greatest memoirs ever written, My Past and Thoughts, which is a massively important source on the Russian intelligentsia as well as being a very entertaining read. So he would seem like the ideal subject. But for all the wealth of detail he presents, relatively little of My Past and Thoughts is devoted to his London life, and in general Herzen does not provide us with much commentary in other sources either. This may have been because he did not feel any rapport with the English, so failed to establish any real friendships, as Isaiah Berlin suggests. Perhaps, as London was the first long-term home he established after the disillusionment and failure of the revolutions of 1848, he was in no mood to seek out new acquaintances. Certainly, his description of his first days in London speak to preference for isolation: ‘I grew unaccustomed to others’; ‘Nowhere could I have the same hermit-like seclusion as in London’; ‘There is no town in the world which is more adapted for training one away from people and training one into solitude than London’ (My Past and Thoughts, pp. 445-7). According to Bernard Porter (Exiles, p. 43), such negative feelings about Britain were common among the political refugees who arrives after 1848 – most of them had no desire to be here. In London Herzen first lived alone, then with his own family, accompanied by the German writer Malwida von Meysenbug, who acted as housekeeper, governess and surrogate mother to Herzen’s children from 1853 (for more on her see Carol Deithe’s essay in Exiles). In 1856 the entourage was extended by the arrival of his old friend Nikolai Ogarev and his wife Natalia Ogareva, and ultimately by the children she had with Herzen. Throughout his stay, Herzen moved around quite a lot, and a couple of his residences have proved slightly difficult to track down. After an initial stay at Morley’s Hotel, Trafalgar Square (Sobranie sochinenii 24, p. 321), by the end of August 1852 he had moved across Trafalgar Square to 4 Spring Gardens. 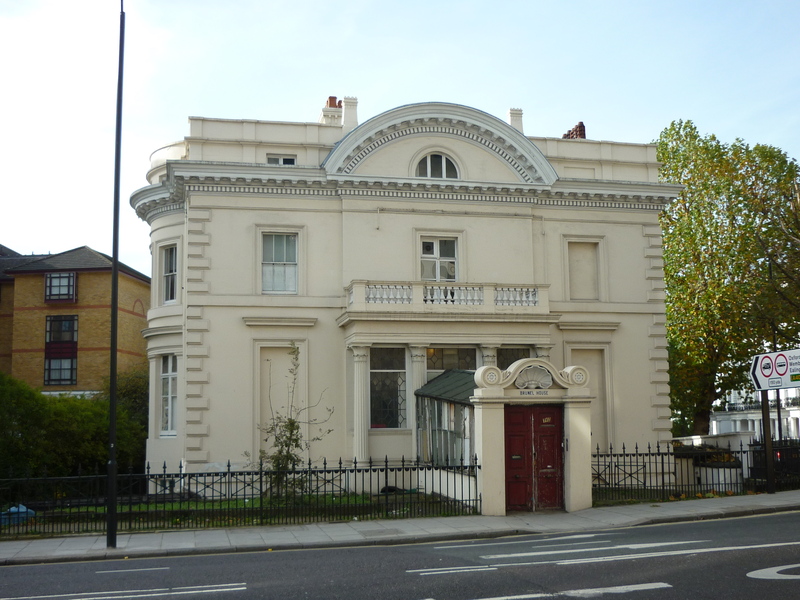 He then found new lodgings in Primrose Hill (My Past and Thoughts, p. 445), at 2 Barrow Hill Place (Sob. soch. 24, pp. 356-7), and on the back of a letter to Maria Reichel he provides a handy (although in fact not particularly informative) sketch of the location. Towards the end of March 1853, he moved to 25 Euston Square (Sob. soch. 25, p. 33). He then moved out to Richmond, first taking lodgings at 3 St Helena Terrace (p. 191) by August 1854, then at Bridgefield Villas, Willoughby Road, Twickenham in October (p. 203), then Richmond House, Twickenham in January 1855 (p. 222), where 9 King Street is now. At the end of March 1855, he moved to Cholmondeley Lodge, 1 Cholmondeley Walk, Richmond; in his memoirs he recorded that Dr Vensky, ‘the first Russian who came to see us after the death of Nicholas [on 2 March 1855] … was perpetually amazed that it should be so spelt, but pronounced Chumly Lodge’ (My Past and Thoughts, p. 531). The Herzens remained at Orsett House until June 1863, and then moved out again to Elmfield House, Teddington, where they lived for just over a year (p. 348). This is now a dental practice, and it seems to be fairly well established that Garibaldi, on his three-day trip to London in 1864, visited Herzen there. 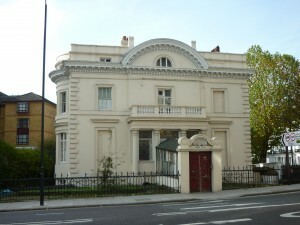 Returning to London in September 1864, Herzen lived at Tunstall House, Warwick Road, Maida Hill (Sob. soch. 27.2, p. 512) – is this Warwick Avenue? His final London address two months later is 11 Eastbourne Terrace, which runs parallel to Westbourne Terrace, but he was there only a matter of days (pp. 521-6). The extended family was breaking up, in part because of the arrival of twins to Herzen and Ogareva, and a return to Europe became inevitable (Carr, pp. 248-9). Herzen returned for a couple of weeks in late February 1865, staying with Ogarev at 6 Rothsay Villas, Richmond, but departed for good on 15 March 1865. After his initial lonely days, Herzen was certainly not short of company. He seems to have made few English friends, although he sought acquaintance with Thomas Carlyle soon after arriving in London and visited the Carlyles’ house at 24 Cheyne Row, Chelsea (this letter from Jane Carlyle dated 15 September 1852 mentions one such visit from the evidently rather exotic seeming guest, and introduction to volume 27 of the Carlyle letters gives more details of their encounters in 1852). But his life continued to be conducted mainly in Russian circles. In addition to being joined by Ogarev, Herzen was visited by a great many Russians during their European travels – on Sundays, the Herzen household was definitely the place to be. I’ll be publishing separate posts in the coming weeks about the short visits of Tolstoy (March 1861) and Dostoevsky (July 1862), Turgenev’s regular stays London while Herzen was based here, and the year or so that Bakunin spent here (December 1861-April 1863). Herzen features prominently in all these stories. Among other literary figures, he was also visited by Chernyshevsky in 1859 (very little is known of this trip), Nekrasov, the poet and editor of the journal Sovremennik (The Contemporary), in 1857, and at various points by the critics Pavel Annenkov and Vasily Botkin (Waddington give numerous details beyond the Turgenev-Herzen relationship). He also regularly received and gave assistance to an assortment of impecunious Russians – the story of his encounters with Prince Yuri Nikolaevich Golitsyn is very wittily told in My Past and Thoughts (pp. 539-49). Nor, despite his change of heart following the disappointments of 1848, did Herzen abandon revolutionary circles, and he regularly saw fellow exiles living in London, such as Giuseppe Mazzini, Louis Blanc, and other visitors, such as Armand Barbes (My Past and Thoughts, p. 453). It was through these figures, according to Carr, that Herzen was drawn out of his isolation to speak at public meetings for his cherished causes. On 29 November 1853 he spoke at the Hanover Rooms (presumably in Hanover Square) to celebrate the anniversary of the Polish insurrection of 1830, and on 27 February 1855, he participated at a meeting at St Martin’s Hall, Long Acre, to commemorate the 1848 revolutions. Marx, who harboured a long-standing antipathy towards Herzen, turned down an invitation to the event as he would not share a platform with Herzen (Carr, pp. 139-40). However, such engagements were few and far between, and Herzen remained essentially a private figure. He made the decision to stick solely to intellectual and propaganda work. This led to the foundation of the Free Russian Press, with offices first at 2 Judd Street and later at Thornhill Place, Caledonian Road. The latter offices were visited by a journalist from the Saturday Review, who was startled by the exotic atmosphere: ‘the rooms which they occupy are pervaded by so thoroughly Slavonic an air that a visitor might imagine that they had been suddenly transported to Moscow or Petersburg. Russian books occupy the shelves, Russian proof-sheets cover the tables and Russian manuscripts are being set up by the compositors whose speech is Russian or Polish’ (cited in Partridge, pp. 460-1). Two very important publications came out of the Free Press, the almanac Poliarnaia zvezda (The Polar Star, 1855-62 and 1869) and the journal Kolokol (The Bell, 1857-67). 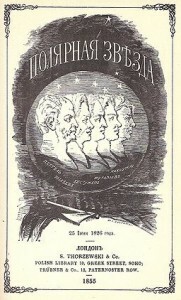 Poliarnaia zvezda was an annual publication which featured writings by Herzen and Ogarev, but also a large number of works by Decembrists (Ryleev, Bestuzhev, Lunin, etc) unsurprisingly, as it was a revival of the Decembrists’ almanac from the early 1820s and had their images on its cover. 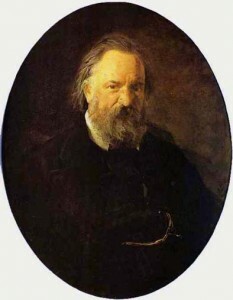 There were also contributions by European radicals and revolutionaries (Michelet, Mazzini, Proudhon), and works that could not at the time be published in Russia, such as Chaadaev’s First Philosophical Letter. Kolokol started out as a supplement to Poliarnaia zvezda, but became the more influential publication. In My Past and Thoughts, we read: ‘”The Bell is an authority,” I was told in London in 1859 by, horrible dictu, Katkov’ (p. 533), and if such a reactionary figure was prepared to admit this, it must have been very popular indeed. Large numbers were smuggled into Russia (I’ve seen references to print-runs of 3,000-5,000), and it was pretty much required reading for everyone from radicals to government officials at the highest level. It featured literary works and articles on contemporary conditions in Russia – you can download it here. 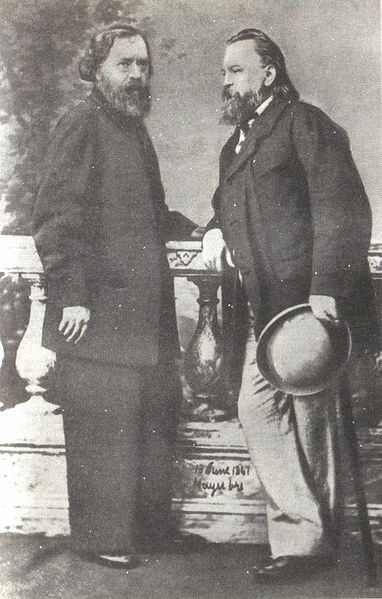 Its influence began to wane after a split with the liberals that followed the emancipation of the serfs, but it was really Kolokol’s support for the Polish uprising of 1863 – as a result of friendship with Bakunin and probably against Herzen’s better judgement – that its popularity really declined. I’m not intending for the moment to write a separate post on Ogarev. This is mainly because his life in London was so bound up with Herzen’s, both professionally, in their work on Poliarnaia zvezda and Kolokol, and privately, not only in the closeness of their friendship, but also in the unhappy menage-a-trois with Ogarev’s wife Natalia that began not long after the couple arrived in London. So there would be very little different to say. But it’s also a reflection of the fact that in scholarship, as in life, Ogarev has been overshadowed by his more famous friend. For anyone who’s particularly interested, Carr’s The Romantic Exiles contains a couple of chapters on Ogarev, though I feel they’re not helped by his vicious assessment of Natalia Ogareva. Perhaps she deserved it, but a little more detachment would have been welcome. Nevertheless, a few details are worth noting. After Natalia Ogareva took up with Herzen, her husband’s position within the household was precarious, and Ogarev frequently took lodgings elsewhere, only to return to Herzen’s and then move out again. According to Carr (p. 337), he lived at various times in Richmond, Sydenham, Putney and Wimbledon. In 1858 Ogarev fell in love with Mary Sutherland, a prostitute he met in a pub (he was always a heavy drinker). He installed her and her son Henry in a flat in Mortlake and supported them for the next six years. When he left London for Geneva, Mary travelled with him, and they lived there separately at first, but later together. They returned to Britain in 1873, and lived together in ‘small house in a mean street’ in Greenwich (Carr, p. 344). Ogarev died in 1877 and was buried in the cemetery on Shooter’s Hill, now Greenwich Cemetery (Carr, p. 346). His grave was still visible when Carr was writing the book in the early 1930s, but his ashes were later reinterred in Novodevich’e cemetery, Moscow. I have annotated my Russians in London Map with places associated with Herzen and Ogarev (marked in yellow). The scattering of markers, mainly over West and North West London, is quite striking, particularly as most denote places where Herzen and his extended family lived. It suggests to me a constant sense of discomfort, of never feeling at home, and always looking for somewhere better. Perhaps this is what life as a political exile meant. For Ogarev, I have only been able to include some very general markers, as I do not (yet) have more detailed information. But the places I have been able to mark are notably in the suburbs, and at a considerable distance from where Herzen was living (and with a definite preference for South London!). When Ogarev returned to England in 1873, maybe he chose to live in Greenwich because of Mary’s connections, as Carr suggests. Or maybe he still preferred to remain as far as possible from the London he associated with his friend, even after the latter was dead and gone. My thanks to Carol Davies Foster from Education, Children’s and Cultural Services, London Borough of Richmond Upon Thames, for information on the precise locations of Richmond House and Bridgefield Villas in Twickenham. I live opposite Hertzen’s actual house in Orsett Terrace and can send you a photo, but not sure how to get it to you. It is identical in design to the (wrong) one you featured, which was Brunel House round the corner. Many thanks for this. I do actually have some photographs of the correct house and the plaque, but have been very slow to revise the post and include them. Thanks for the offer anyway! Herzen did not just have encounters with Westernisers during his years in London: in the summer of 1864 he met with the famous Slavophile Yuri Samarin in a hotel which is now the site of the Unilever Building on Blackfriars Bridge.